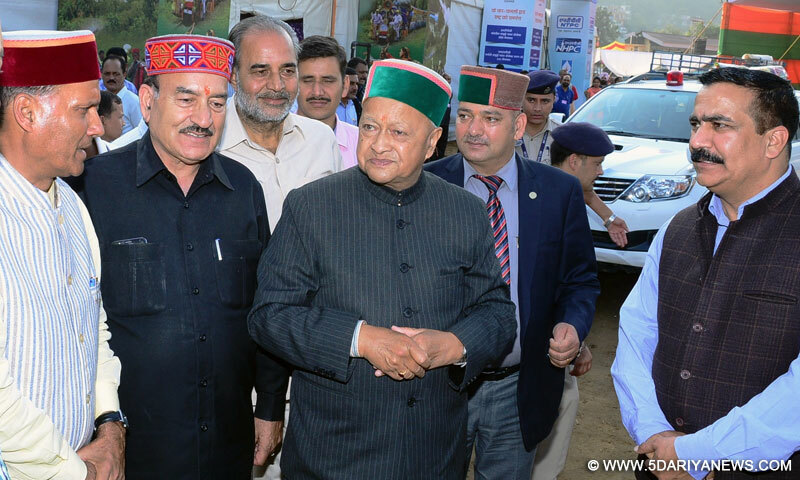 Chief Minister Virbhadra Singh today went to Paddal ground in Mandi to take stock of security and other arrangements, a day before Prime Minister Shri Narendra Modi’s visits to the State. He said that we heartily welcome the Prime Minister to the State. Health and Revenue Minister Shri Kaul Singh Thakur, Member of Parliament, Shri Ram Swaroop Sharma, Director General of Police, Shri Sanjay Kumar were also present on the occasion along with senior officers of the Prime Ministers office and the district administration.The Chief Minister also visited the rally site in the ground from where the Prime Minister will dedicate the three hydel projects, Rampur (412 MW), Koldam (800 MW) and Parbati hydel project (512 MW) to the Nation tomorrow. Later, while talking to media, he said that we don’t want to leave any stone unturned to give warm welcome the Prime Minister. He said that the funds being received from the centre for development purpose were being properly utilised. On being questioned about the elections in the state, he said that the Assembly elections would be held as per schedule and the Congress Party would repeat itself in the State.